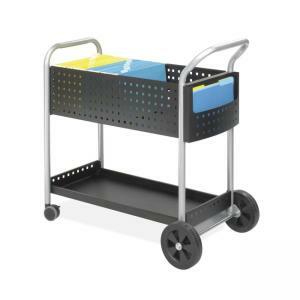 Scoot Mail Cart offers durable steel construction and modern styling for use around the office. Oversized casters, convenient handle and side pocket make this cart easy to use. The top basket will hold 120 legal-size folders, and the bottom shelf will hold packages of various sizes. Overall capacity is 300 lb. A lip around the shelf keeps packages from sliding off during transport. Mail cart rolls easily on 3" front swivel casters and oversized 8" rear wheels.